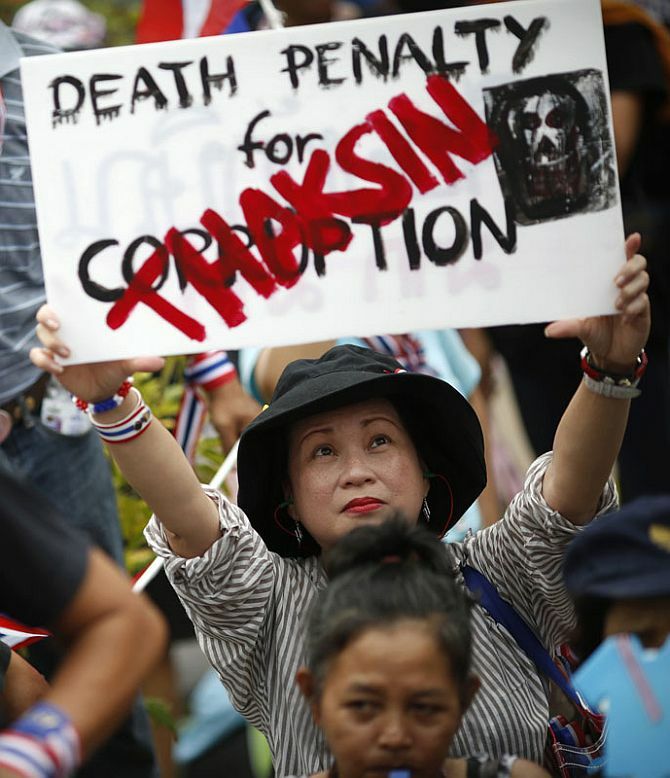 Rediff.com » News » Protests in Thailand: What's it all about? Protests in Thailand: What's it all about? 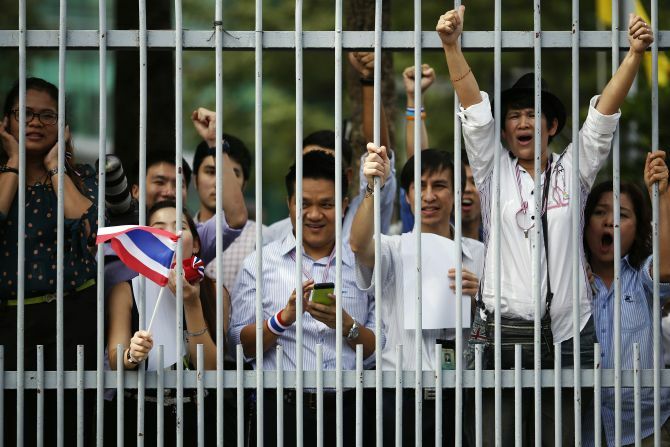 The uprising in Thailand has plunged the polarised nation deeper into crisis. The current turmoil is a confrontation between the Thai elite and the educated middle-class who support the Democrats and are anti-Thaksin (former prime minister) and the rural poor who are pro-Thaksin. Pro-Thaksin parties have won all polls since 2001, and the Democrats lost to the ruling Puea Thai Party during a landslide vote that brought Thaksin’s sister Yingluck Shinawatra to power in July 2011. Thailand has seen 18 actual or attempted coups since it became a constitutional monarchy in 1932. Rediff.com answers a few basic questions. Anti-government protesters demanding resignation of Thai Prime Minister Yingluck Shinawatra flooded the streets of Bangkok on a call given by the Opposition to topple the government. Yingluck Shinawatra’s government is under pressure after widespread anger over its recent failed attempt to pass a bill by Yingluck's ruling Puea Thai Party that could have granted amnesty to her brother Thaksin Shinawatra and others, and could have absolved Thaksin of his graft 2008 conviction. The bill, which would also absolve those responsible for military crackdown on Red Shirt movement in 2010, was passed by the lower house but rejected by the upper house. The protesters alleged that Yingluck's government is controlled by her fugitive brother Thaksin Shinawatra, who was forced to quit as the prime minister in 2006. He has since lived in exile except for a short visit to Thailand in 2008. Pro-government supporters, known as "Red Shirts", also had gathered in huge numbers, raising a possibility of clashes between the two groups, the most serious confrontation since the bloody protests in 2010. A Thai business tycoon turned politician, Thaksin Shinawatra founded the populist Thai Rak Thai party in 1998. He became prime minister of Thailand from 2001 until 2006 when he was overthrown in a military coup. His brazen leadership style forged enmity with the country’s Bangkok-based traditional elites. Thaksin has since lived in exile. He was convicted by the Supreme Court's for abusing his power and corruption. Various criminal charges await him if he returns to Thailand. His sister, Yingluck Shinawatra, however, is the current prime minister of Thailand. Thailand has witnessed instances of sporadic unrest since former premier Thaksin was deposed in a military coup seven years ago. What do the demonstrators want? Anti-government supporters now want to boot out the government. But government-supporting "Red Shirts" have vowed to bolster Yingluck's embattled administration. Thousands of flag-waving Thai protesters stormed government buildings as they intensified their mass political rally against embattled Prime Minister Yingluck Shinawatra. Protesters chanting "Thaksin get out, army come in", called for the intervention of the military in a country that has seen 18 actual or attempted coups since it became a constitutional monarchy in 1932. Thailand's Opposition Democrat party leader and former premier Abhisit Vejjajiva urged Yingluck and the ruling Pheu Thai Party to take responsibility for the protests. Opposition Democrat Party leader and former premier Abhisit Vejjajiva attacked Prime Minister Yingluck denouncing her as the "centre of comprehensive corruption practises". Suthep, a former deputy prime minister and senior leader from the opposition Democrat party, vowed to "seize all ministries". Beleaguered Thai Prime Minister Yingluck Shinawatra on Monday declared emergency in the capital after anti-government demonstrators stormed the compounds of two key ministries, dramatically escalating their protests aimed at toppling her regime. "While the government will enforce the laws it will not use force against the people," Prime Minister Yingluck said as she invoked the Internal Security Act in the entire capital and surrounding areas. "The government would like to ask people not to join illegal protests and to respect the law," she said. 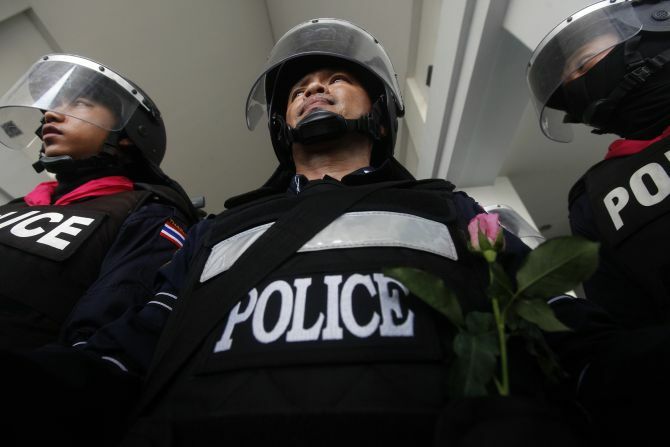 A Thai court on Tuesday approved an arrest warrant for a top anti-government leader as thousands of demonstrators besieged government buildings demanding beleaguered Prime Minister Yingluck Shinawatra's resignation. Thaksin's ouster spurred the protest movement that developed over the years into the widespread "red shirt" demonstrations that occupied upscale parts of Bangkok in 2010, CNN reported. A prolonged series of political protests occurred in Bangkok against the Democrat Party-led government. The protests were organised by the National United Front of Democracy Against Dictatorship (known as "Red-Shirts"). The UDD called for prime minister Abhisit Vejjajiva to dissolve parliament and hold elections earlier than the end of term elections scheduled in 2012. The protests escalated into prolonged violent confrontations between the protesters and the military, and attempts to negotiate a ceasefire failed. The crackdown by security forces on the red shirts resulted in clashes that left around 90 people dead and more than 2,100 injured by the time the military successfully cracked down on the protesters on 19 May. How has the protest affected tourism? The political instability has worried the country's tourism industry. The tourism industry could lose 25 billion Thai Baht in revenue next month if countries issue their highest warnings against travelling to the Kingdom, Sugree Sithivanich, deputy governor for marketing communications of the Tourism Authority of Thailand, said. If the scenario got even worse, like in 2008 when SuvarnabhumiAirport was shut down by protesters, the tourism outlook would be hit even harder. According to the TAT's projection, the number of foreign tourists would plunge to 650,000 in December, a decline of 18-20 per cent year on year. The demonstrations escalated troubles for Prime Minister Yingluck since she took office in 2011 as she faced a no-confidence motion in Parliament. She convened a meeting with key government officials at Parliament to handle the protesters to various ministries. A member of the Pheu Thai Party, the 28th and current Prime Minister of Thailand following the 2011 general election. 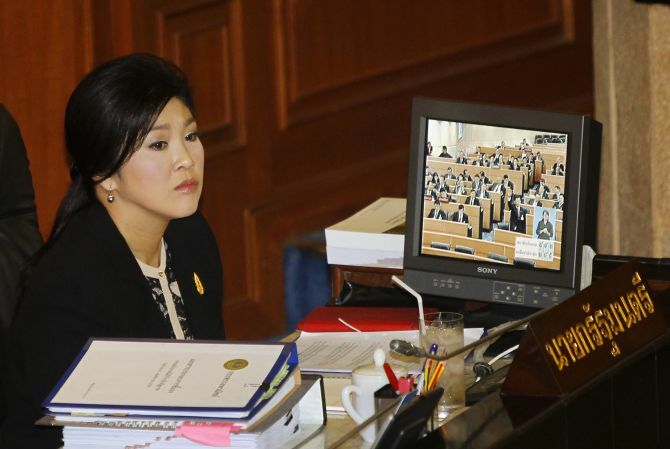 Yingluck is Thailand's first female prime minister. She is the youngest prime minister of Thailand in over 60 years.